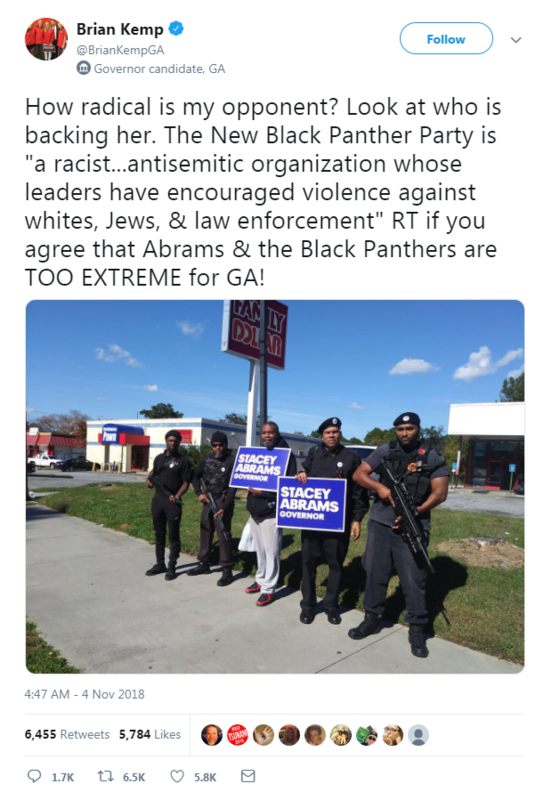 Georgia Democratic gubernatorial candidate Stacey Abrams is being attacked by conservative media and her opponent, Georgia Secretary of State Brian Kemp, because a group of people affiliated with the New Black Panther Party (NBPP) marched in support of Abrams while openly carrying rifles. 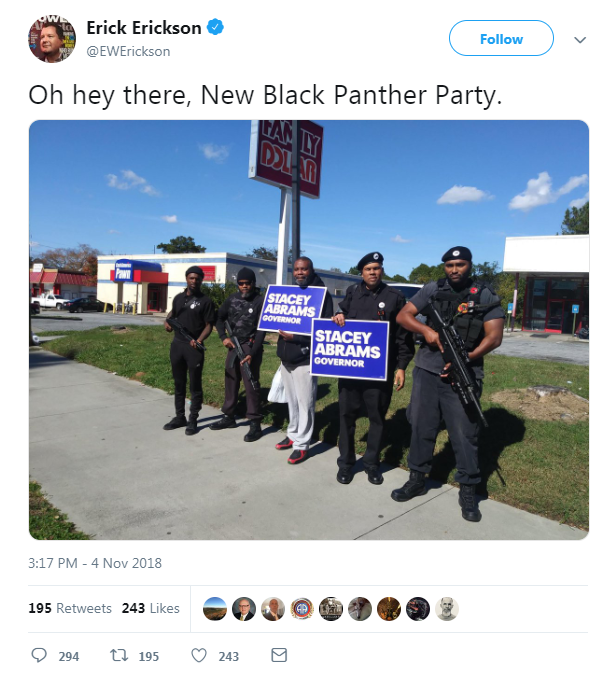 The conservative figures promoting the story have shown no tie between the New Black Panther Party and Abrams -- the story is just yet another conservative media smear that falsely connects the fringe hate group to mainstream Democratic figures. 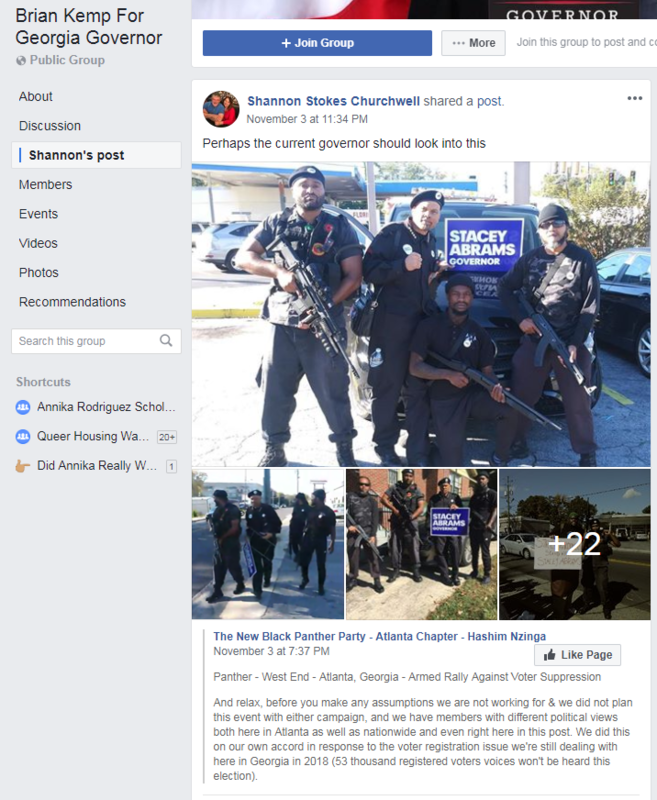 Photos of NBPP members with campaign signs supporting Abrams were first posted to Facebook on the evening of November 3, by two pages seemingly affiliated with the fringe organization. 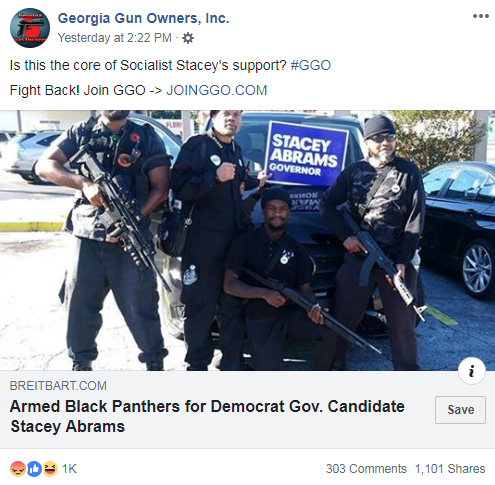 A few hours later, users began sharing these posts to right-wing Facebook groups, including one group dedicated to Kemp’s gubernatorial bid that says it’s not affiliated with the campaign. While the NBPP photos were being spread, a video posted by a Kemp supporter on Facebook showing the NBPP members was also making rounds on right-wing groups. 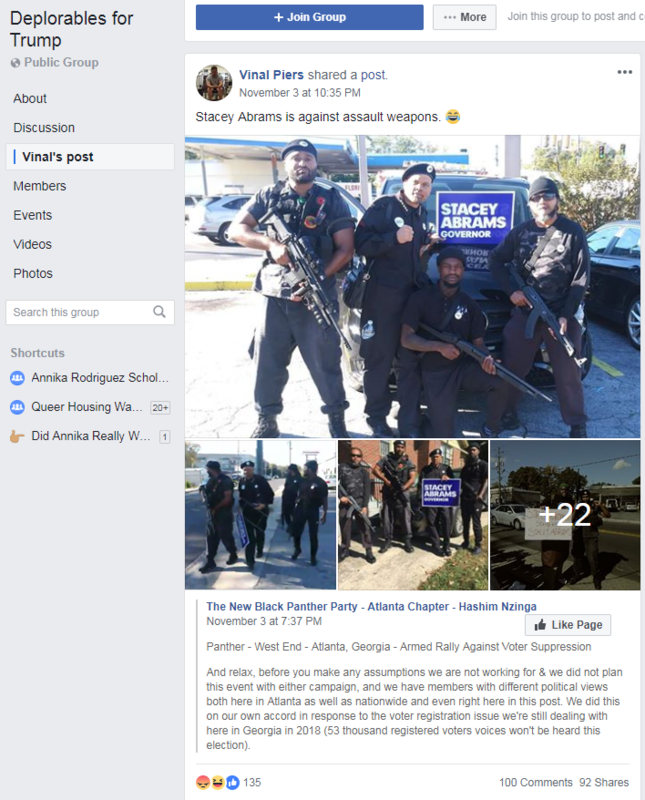 The next morning, Kemp shared one of the photos posted by the NBPP on Facebook, Instagram, and Twitter. 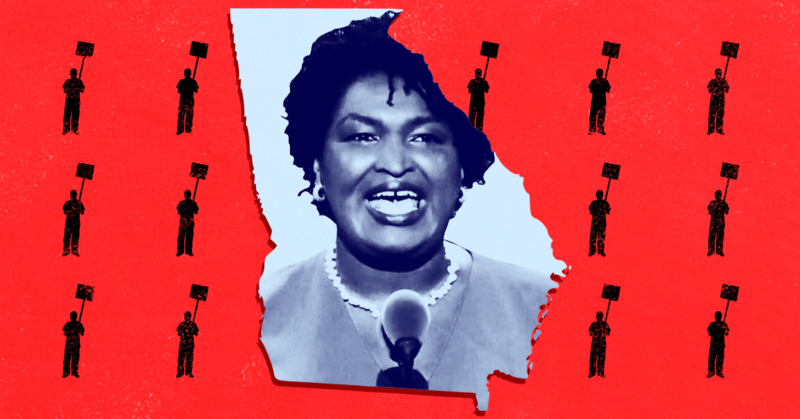 In all three posts, Kemp called Abrams “radical” and “TOO EXTREME” for Georgia. 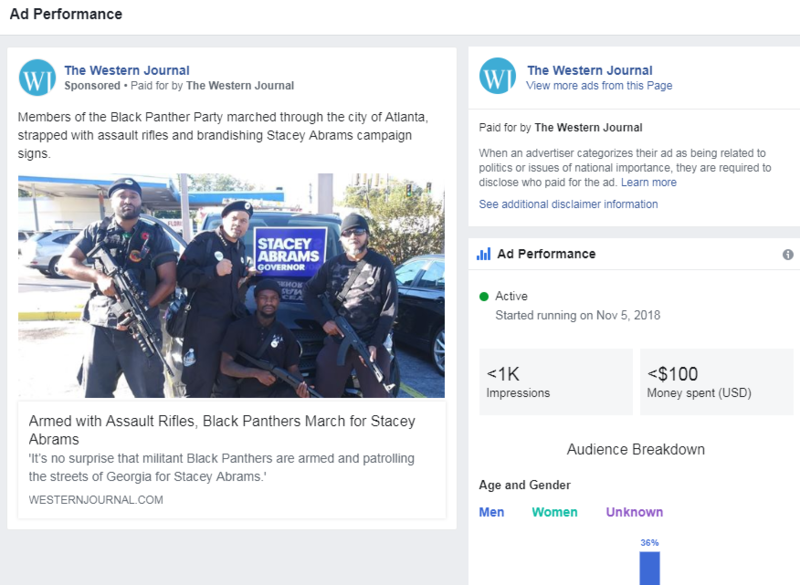 Other right-wing Facebook pages shared Kemp’s post while the far-right news site The Western Journal ran an ad promoting a write-up of the story. 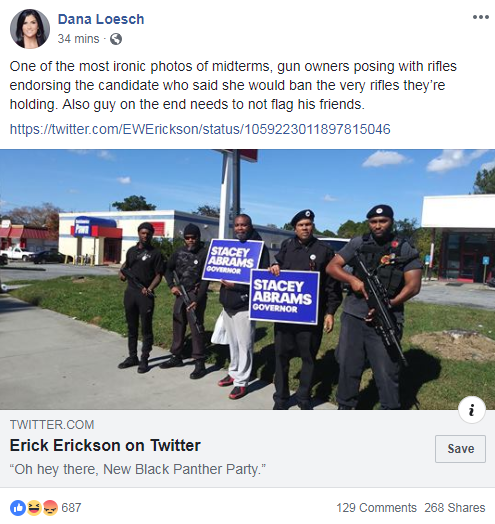 Conservative media figures Erick Erickson and NRA spokesperson Dana Loesch also shared the images. 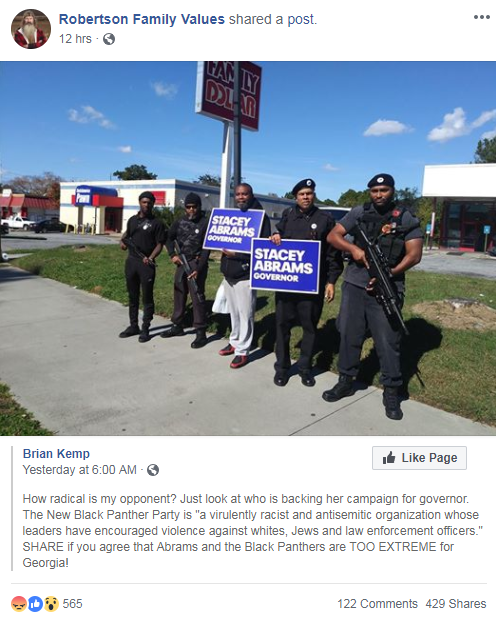 Since Kemp posted the photo, far-right and fake news sites have attacked Abrams while falsely claiming her campaign was affiliated with these NBPP members. 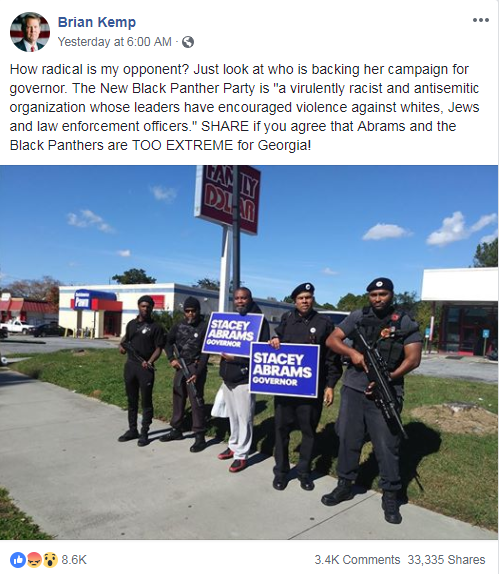 GINGRICH: You just had Black Panthers in Atlanta, for example, carrying what looked like semi-automatic weapons, for Stacey Abrams. You want a really radical America? You can get one, and she'd be -- if she wins, she'll be the most radical governor in the country, with the possible exception of [San Francisco’s] Gavin Newsom. 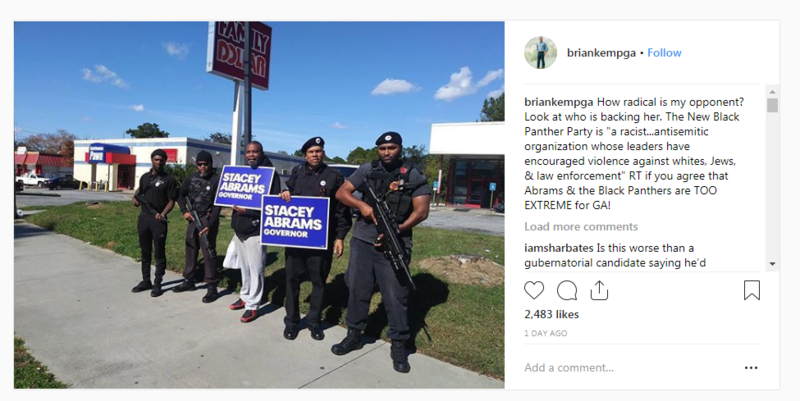 Breitbart News posted an article whose headline states that “armed Black Panthers lobby for” Abrams. The article earned just over 71,000 engagements on social media and was posted by a pro-gun Georgia Facebook page. The Daily Caller criticized Abrams for attacking Kemp instead of addressing the NBPP march. In a Daily Calles write-up of the NBPP’s march, Jason Hopkins wrote that an Abrams campaign statement he received in response to questions “did not specifically address the Panthers’ march, but instead attacked Kemp.” The article amplified Kemp’s calls on Abrams to denounce the NBPP and earned over 38,000 engagements on social media. Reprints of the article by The Western Journal, BizPac Review, and The Tennessee Star earned an additional 41,000 interactions. NBPP, which was founded in 1989, is an “anti-white and antisemitic” group, according to a report on the group’s activities published by Southern Poverty Law Center. The original Black Panther Party has condemned NBPP as a “black racist hate group,” and it has also been denounced by the NAACP. The group rose to national prominence in 2008 after a video went viral that showed two NBPP members at a polling site in Philadelphia, PA, one of whom was carrying a nightstick. The Department of Justice launched an investigation into the incident that ended with a default civil judgement against the armed NBPP member after the Bush administration decided to pursue civil, rather than criminal, charges against the men. 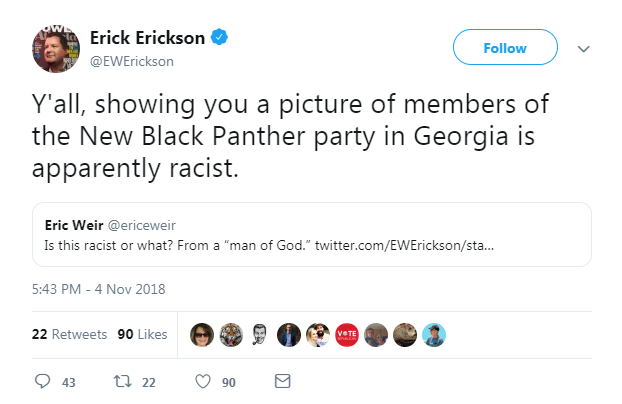 Conservative media endlessly scandalized the outcome of the DOJ investigation, although a 2011 report issued by the department’s Office of Professional Responsibility found “that politics played no role in the handling of the New Black Panther Party case, which sparked a racially charged political fight,” according to The Washington Post. Right-wing media still often cite the 2008 incident before Election Day. In 2016, conservative media supporters of then-candidate Donald Trump raised concerns about the NBPP to defend Trump from criticism after he suggested the 2016 election would be “rigged” by voter fraud. Conservative media frequently used extraordinarily tenuous or entirely nonexistent evidence in attempts to tie NBPP to President Barack Obama -- a similar tactic to what right-wing media figures are now trying to accomplish in the Georgia gubernatorial race.